Coupland Zoning . . . Why? I have stated before that if our primary impetus to incorporate has been to “keep Coupland, Coupland” as well as to prevent annexation by outside community forces, curtailing our freedom with imposition of ordinances and regulations, why are we now considering shooting ourselves in the feet by doing the same thing volitionally? If Coupland has not had or needed zoning in its whole history, what is the justification for imposing it now? We have had ample evidence of government intrusion, coercion and over reach in our faces every day since 2009, from an out of control federal regime, run by the most corrupt, coercive, intrusive anti-constitutional president in American history. We will be ostensibly creating the same situation here by introducing unnecessary circumscription of property rights and the right of individuals to live with a minimum of governmental intrusion at the community level, the first and last bastion for preservation of individual freedom. 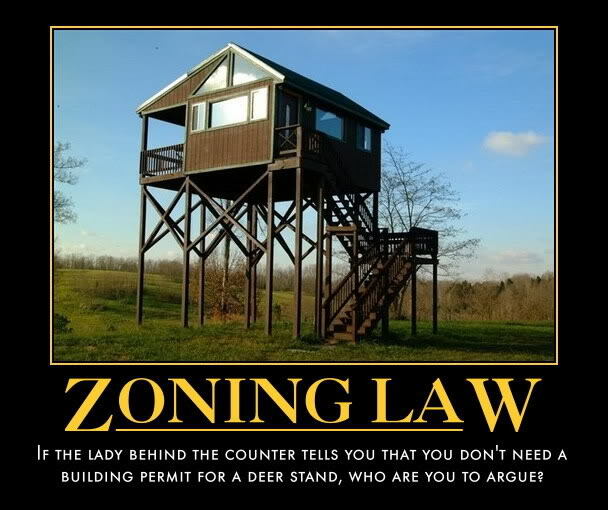 Today, it’s zoning but how long till it’s decided that Coupland can dictate what color your house may be or what vehicles you can or cannot park on your own property or what height your grass must be trimmed…. you get the idea. Once we start down the slippery slope of imposing controls, constraints and proscriptions on personal liberty and private property rights, there is no end to the potential damage and mutation which may accrue, to obviate what we supposedly incorporated to preserve: the basic freedom to be left alone by government. This entry was posted in Government Policy, Opinion & Commentary and tagged City of Coupland Texas, Jim Huntington, zoning on March 13, 2014 by Stewart Dale Spencer. As Jim and a family member pointed out, implementing “zoning” is a slippery slope, but, I think, it doesn’t have to be dangerous to personal freedoms. A big part of my wanting to live in the country was to have the freedom to do whatever I want with my land and my house. Someone on my road fairly recently parked some older (classic??) cars close to the road to sale them. My “knee jerk” reaction was “How dare they?” Since then, I’ve reflected. I don’t see a dangerous situation and who am I to tell anyone what to do with their property. There is an effort to maintain the site. Someone mowed the grass lately. On the other side of the issue, I don’t want a pig farm or waste management facility next door to me. I doubt anyone in town does either. Right now, there is no way to curtail that happening anywhere in the city limits as long as it is in compliance with State and County regulations. Coupland will grow-that is a certainty. I don’t know how or when exactly, but it will. Part of my reason for voting for incorporation was Coupland being able to retain a say in how that growth happens. I absolutely don’t know exactly how that “say” should be implemented, but strongly feel there needs to be something. I would like for Coupland to remain exactly as it is. Realistically, as time goes on, I just don’t see how that will happen. It may be that my grandkids are the ones that will have to deal with big growth. My hope is that we can leave them some means to guide that growth. As I stated, I don’t want anyone telling me what to do with my land either. I just want us able to have some say in how change happens. It will be difficult to implement anything that is not subjective. I sincerely hope whoever decides what the zoning ordinance will be will not impose “city” regulations. That would be insanity if the aim is to keep Coupland as close to what it is as possible. I hope a way can be found to make the slope not so slippery.